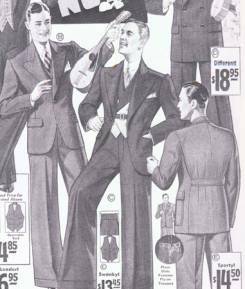 Men's suits in the 1930s were tailored to create the illusion of a large torso, with wide, padded shoulders and tapering sleeves. Trouser pants were still creased and cuffed at the bottom. 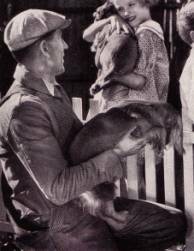 However, the Great Depression put many men out of work, and many families fell on hard times. Not all men could afford the fashionable suits. More traditional, nondescript work clothes were worn by the average man. Wide, padded shoulders, tapering sleeves, peaked lapels, and V-shaped neck all characterize the 1930s suit. The trench coat became quite popular during the 1930s, with a double-breasted front, wide, pointed lapels, and belt around the waist. Clothes for the working classes changed little. 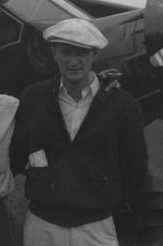 The cap seen below was quite popular for the working man. 1930s Cap: Image courtesy of the University of Vermont Landscape Change Program and the Vermont State Archives. Image courtesy of National Geographic Society. 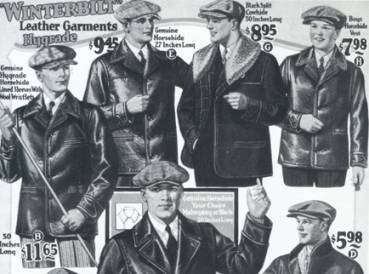 At the end of the 1920s and into the 1930s, the leather jacket with cap was a popular style.